Offer hummingbirds plenty of nectar in two areas of your garden with these Best-1 Glass Hummingbird Feeders. All elements of these feeders combine for easy-to-use and hardy additions to your garden. Each glass bottle holds up to 32 ounces of nectar, and its red artwork seamlessly blends with the red plastic base. The clear vessels make it simple to monitor nectar levels, and an innovative Hummer Counter on each bottle helps you gauge your hummingbird population. Each bottle installs in moments onto its red plastic base, and eight ports on each base provide plenty of hummingbird dining spots. A built-in perch around this section allows the birds to rest while dining, and the center section of the base removes for thorough cleaning. Each of the ports is bee and wasp resistant, and the plastic bases are FDA approved for food contact. Place these feeders on a bracket or hook using their attached metal hangers, so you can enjoy watching your birds dine. The clean lines, large capacity, and ease of filling these pieces will certainly make your yard a fantastic retreat for your feathered friends. Keep hummingbirds well fed with these Best-1 Glass Hummingbird Feeders. Made in the USA. 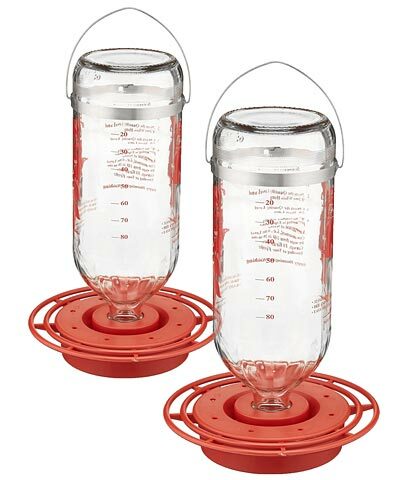 Note: This case pack includes 2 of the Best-1 Glass Hummingbird Feeders. Best-1 Glass Hummingbird Feeder, 32 oz. More Birds Jubilee Hummingbird Feeder, 32 oz.